Enabling “Send to Mail Recipient” option in Excel and Word will allow you to quickly access the default Email client on your computer and send Word Documents and Excel spreadsheets by Email. 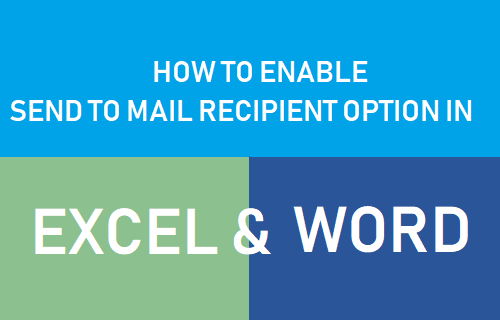 Enable Send to Mail Recipient option in Excel and Word. Both Microsoft Word and Excel Programs are equipped with an in-built ability to open the default Email Client on your computer, directly from within Excel and Word files. However, many users are unable to find “Send to Mail Recipient” option in Word and Excel as this feature is not enabled by default in Microsoft Excel and Word. 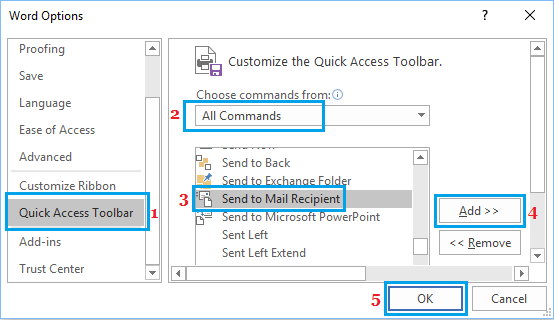 You will be able to see and access “Send to Mail Recipient” option in the Quick Access Toolbar only after going through the steps to enable this option in Excel and Word. Once “Send to Mail Recipient” option is enabled, you will be able to access the Email Client on your computer, directly from within Microsoft Excel and Word files. Follow the steps below to enable Send to Mail Recipient option in Microsoft Word program on your computer. 2. Click on the small Down Arrow located at the upper left corner of your screen and click on More Commands. 3. On the Word Options screen, click on Quick Access Toolbar > choose All Commands > select Send to Mail Recipient and click on the Add button to add Send to Mail Recipient Option to Quick Access Toolbar in Word. 4. Click on OK to save this setting for all Word Files on your computer. Now, you will be able to see the Send to Mail Recipient option in Quick Access Toolbar in Microsoft Word. 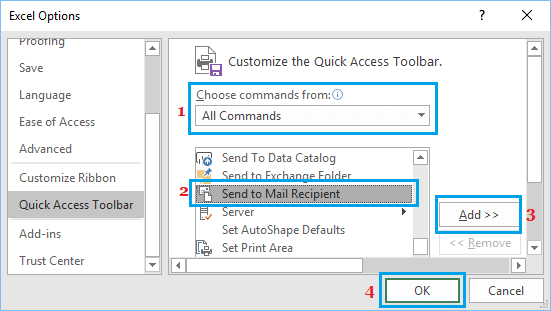 Follow the steps below to enable Send to Mail Recipient option in Microsoft Excel program on your computer. 1. Open Microsoft Excel Program on your computer. 3. On the next screen, select All Commands > Send to Mail Recipient and click on the Add button. 4. Make sure you click on OK to save this setting for all Excel Files on your computer. After this, you will be able to see and access the Send to Mail Recipient option from the Quick Access Toolbar in Microsoft Office Program on your computer. 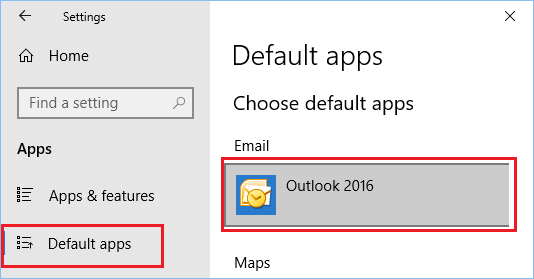 Select your default Email Client under “Email” section of Choose default apps screen.